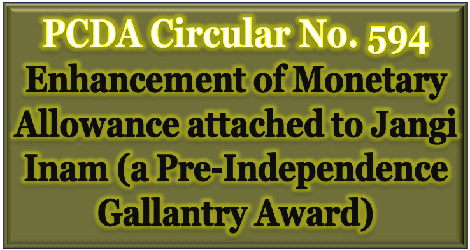 Subject : Enhancement of Monetary Allowance attached to Jangi Inam (a Pre-Independence Gallantry Award). 5. The payment of ‘Jangi Inam’ at enhanced rate will be subject to all other conditions governing the payment of Gallantry Award. The payment may please be made at the enhanced rate after determining the eligibility in each case by a careful scrutiny of PPO notifying the award.